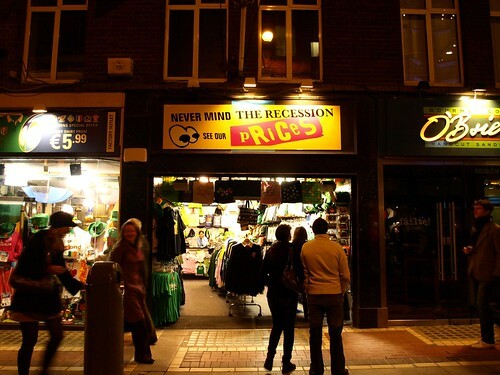 The main thing being discussed here, unsurprisingly, is the recession, what with Dell leaving Ireland and tens of thousands of jobs lost. More surprising is the speed with which small tourist traps adjust to it. I like their attitude. And the visual punk music reference. 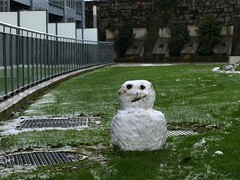 For a few days, however, the recession was boring compared to the really big news: The Snow Chaos. For proper chaos, including a complete airport shutdown, one inch is plenty. And when the entire snow of a whole lawn combined is enough to make a knee-high snowman, taxi drivers will still find enough fun facts about snow to fill the long ride from the airport to the center. Our driver was around 60, but she seemed to share her grandchildren's excitement for this fascinating weather phenomenon. Amazingly, snow that melts a little and freezes over makes a crackling sound, and snow that melts more and freezes then makes... well, ice. "You have to be extra careful, dear, it is like... like... like walking on glass!!" She was excited that her grandchildren could finally do all the things they knew only from TV, and all around Dublin, children were hunting for remaining snowballable bits of snow. (Let's digress. Small foray into Polish backyard discoveries: If you have a backyard the size of a medium suburb and everyone in the large multi-story houses around it owns a dog, winter weather and snow that is closer to 10 than 1 inch means that all resulting feces will find a nice, cozy bed, where they will be nicely preserved by the frost, and covered by the next snowfall to give an impression of complete cleanliness. Back to Dublin! The snow made way for glorious sunshine, and now for something halfway between rain and slush that still provide the frequent meteorological variations that every visitor to Ireland expects (and can do without, I would have been fine with lasting sunshine).